120 day advanced purchase applies for year round flights to the USA. 90 day advance purchase applies for year round flights to Canada. Midweek only Monday- Thursday, surcharges apply for weekend travel. Other destinations in the USA & Canada may also be available, please ask one of our Travel Specialists for more information. Flight restrictions may apply, for more information please contact one of our Travel Specialists. Change and Cancellation fees apply, please speak to one of our specialists for details. Qantas is the world’s second oldest airline. It was founded in the Queensland outback in 1920 and is Australia’s largest domestic and international airline. Qantas is recognised as one of the world’s leading long distance airlines, having pioneered services from Australia to North America and Europe. The Qantas story is inextricably linked with the development of civil aviation in Australia. It begins with fragile biplanes carrying one or two passengers in open cockpits and progresses to the new Airbus A380s flying some 450 people half way around the world in a day. The future holds many challenges for Qantas – maintaining safe operations and world class product standards while building a viable and competitive position long term for the airline. Two of the world’s leading airlines are forming a global partnership. Qantas and Emirates fly 14 times a day from Australia to Dubai, and provide ‘one-stop’ access to 65 destinations across Europe, the Middle East and North Africa. They offer the largest shared A380 network, exceptional lounges here and abroad and award-winning service -a truly aligned travel experience. 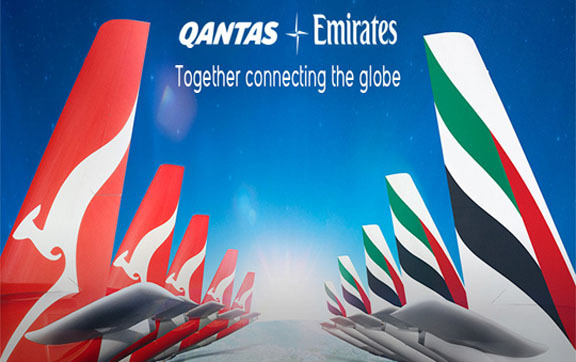 Together, Qantas and Emirates offer one of the most comprehensive international networks in the world. Flying through Dubai on Qantas and Emirates’ 98 A380 and B777 flights per week from Adelaide, Brisbane, Melbourne, Perth and Sydney, you can then connect to more than 65 cities in Europe, the Middle East and North Africa. This includes seven daily A380 services to London Heathrow, and daily A380 flights to Paris, Rome, Munich, Amsterdam, Manchester and Moscow – a total of over 800 flights per week. The new partnership with Emirates will mean more flights and more choice for every Qantas Frequent Flyer. You can earn and use points when flying on the Emirates network. Which means you can use your Qantas points to buy an Emirates flight and vice versa. You’ll also earn Status credits on many Emirates flights, as long as you have a QF flight number on your ticket. Eligible members will be able to use Emirates Lounges across Australia, Europe, Asia, North Africa and the Middle East. However, you cannot use Qantas Frequent Flyer points to upgrade Emirates bookings and vice versa. You can book flights with points right now using Points Plus Pay and Any Seat Award. You’ll also be able to book Classic Awards on Emirates flights across the globe. Eligible Skywards Members and Qantas Frequent Flyers as well as travellers in premium cabins will have access to Emirates and Qantas Lounges. This includes access to Emirates’ First Class and Business Class Lounges in Concourse A in Dubai Terminal 3 and Qantas’ award-winning First Lounges in Sydney and Melbourne, as well as Qantas and Emirates Lounges in Australia, Europe, the Middle East and Africa. Qantas flights through Dubai will use Emirates’ Concourse A in Terminal 3, purposefully designed for A380 aircraft and the first facility of its kind anywhere in the world. A brand new, state-of-the-art facility, Concourse A includes expansive First and Business lounges that run the length of the Concourse, with direct boarding from the lounges to the Concourse’s 20 gates. The Concourse also offers great duty free shopping opportunities, dining, a spa, and a floor dedicated to hotel accommodation. Your overall baggage allowance will be the same on Qantas and Emirates (with the exception of sporting goods and infant allowances). Baggage allowances for bookings made from 26 February 2013 will be aligned with Emirates’ ticketed checked baggage allowances for all flights between Australia, Europe, the Middle East, North Africa and Asia. This includes additional Frequent Flyer and Qantas Club allowances. For more information regarding Qantas’ baggage allowance, please contact one of our Travel Specialists. For First and Business travellers, your journey starts from the moment you leave your front door with our new complimentary Chauffeur Drive service. Eligible customers can now add Chauffeur Drive to their existing bookings for selected Qantas international flights. Three membership tiers above the entry Bronze level – Silver, Gold and Platinum. Members can move up to the next level by accumulating the required Status credits (in addition to normal program points) which can be earned each time they fly on an eligible flight with Qantas, Jetstar, oneworld alliance airlines and Air Pacific (flights must include a minimum of four eligible flights with a Qantas, QantasLink or Jetstar flight number, each year). Each membership level offers particular privileges, including higher priority check-in, baggage allowances and, for Platinum and Gold members, complimentary Qantas Club membership. Eligible Frequent Flyer members also have access to oneworld lounges. The higher the membership status, the greater the privileges including additional points when flying on all Qantas, British Airways and American Airlines flights. Call 13 11 31 (Australia), 0800 101 500 (New Zealand) and +61 3 9658 5302 (outside Australia and New Zealand). An additional assisted award booking fee of 2,500 points per person applies to bookings made via the phones. Flights operated by Qantas to European cities stop over in Dubai. Discover the award winning journey of unsurpassed luxury in Qantas First Class. Your journey begins from the moment you leave your door until you arrive at your destination. Experience a new level of inflight comfort as you stretch out in your fully flat, extra-wide bed. Qantas' Bedding Down service features luxurious pillows, blankets, a duvet as well as a sheepskin mattress. Controls at the end of your armrest move your seat, leg rest and lumbar positioning from a relaxed reading position, to a fully flat bed of up to 212cm on our A380 and 200cm on our B747s. Your space also features an ottoman so you can host a companion inside your suite during the flight. When you fly with Qantas Business Class, from check-in to arrival it's all about you. 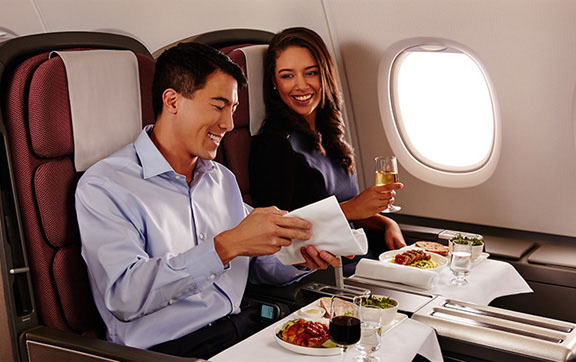 Whether you’re relaxing, working, being entertained or sleeping, Qantas wants you to fly in contemporary comfort. Enjoy a new level of intelligent seating with their award-winning Skybed. Once you’ve made use of your extensive storage space, shift your seat into a position that suits you, using a wide range of seat adjustments. You can explore the seat’s unique massage options or settle in to enjoy your own personal inflight entertainment. You might just want to flick on your reading light and snuggle into your Skybed cocoon with a good book. When you’re ready to sleep, convert your Marc Newson-designed, second generation Skybed into a two-metre, fully-flat bed. Get sleepy in Business. 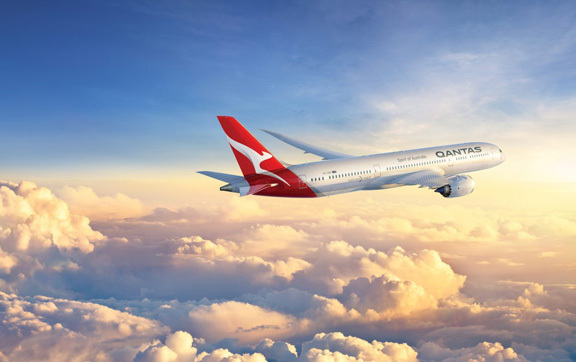 Qantas' sleep service, including a new mattress, duvet and turndown service, is available on selected flights to LA, Dallas, Johannesburg, New York, Singapore, London, Hong Kong, Narita, Bangkok, Jakarta, Shanghai and Manila. Why not try Qantas' T2 Wellbeing tea before you go to bed? Enjoy complimentary lounge access when you travel in Business or First Class with Qantas. Start your international journey in the comfort of the International Business Lounge, found in key Qantas destinations around the world. With fresh, delicious dining options, shower facilities, private work areas, it’s the only way to travel. For more information regarding Qantas Clubs & Lounge access please contact one of our Travel Specialists.